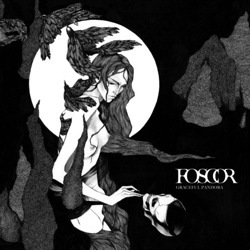 Dark metallers Foscor from Barcelona seem to be very busy at the Fall of 2014. They have recently signed with the Spanish label Alone Records and they will soon release the 7″ single “Graceful Pandora“, while on November 25th, 2014 their new album “Those Horrors Wither” will be out. Foscor have also just released the video for the aforementioned single “Graceful Pandora”, ahead of its release, which you can watch below. The “Graceful Pandora” 7″ single, with artwork by Mia Calderone, which depicts Pandora opening the Box and realizing that she is able to reach beyond the suffering she has unleashed and discover the good behind the experience, will hit the streets on the 3rd of October 2014. “Those Horrors Wither”, which will be the band’s fourth full-length album, will be released in both CD and vinyl versions, and is somewhat of a change of direction for Foscor, whose usual style of ’90’s black and extreme metal has matured significantly as the band adds touches of doom and dark rock, together with traces of prog to their sound. Both albums can be pre-ordered in their label’s web-store. * additional track, CD digipack edition only. ** additional track, vinyl edition only.